The Southern French Alps is a large area so to narrow it down I have focused on the Champsaur valley which is on the southern edge of the Ecrins National Park. It is a beautiful valley, still very French and in touch with it's heritage and culture with a wide range of mountain activities to do in both summer and winter. I know this valley very well and have lived in and around it for 6 years and visited most of the accommodation available as part of my role with Undiscovered Alps, now Undiscovered Mountians. However, I quickly realised when deciding to write this review that to choose the best places to stay is actually very difficult and very subjective! I now understand why the Gites de France and other accommodation labels have their sometimes bizarre criteria for acheiving certain ratings!! So what were my criteria for choosing a good place to stay? First of all it depended on what type of accommodation it was as to what I felt was important. The staff and welcome are more important in a hotel or bed and breakfast than a self catering chalet, for example. In a self catering chalet, good equipment and facilities as well as somewhere comfortable to sit and decent views I thought were important! For all, high levels of cleanliness were imperative!! So in no particular order, here are my top choices and why I chose them!! Although from the outside, this traditional grey farmhouse of the region doesn't look like much, it is a gem of a find. What makes this bed and breakfast particularly special are it's owners. Jean-Marie and Dominique are super hosts. They are discreet but always there when you need them and will bend over backwards to make sure you enjoy your stay. The way they have designed their bed and breakfast reflects this with real attention to practical detail! Upstairs there are three ensuite bed and breakfast rooms decorated in a simple farmhouse style and furnished with traditional alpine furniture. The bathrooms are clean and well maintained. Downstairs there is a children's play area with books, colouring and games with low tables and cushions - perfect for keeping those little ones amused whilst you relax next door in the main living area. In the living area there are two lounge areas, one next to the open fire and one with a beautiful mountain view out of the window. In between is a large dining table where breakfast and evening meals (if you choose) are served all together. There is also a very well equipped kitchen which you can use to make picnics or even cook your own evening meals if you wish. It's no problem to make yourself a cup of tea or coffee whenever you like and make yourself at home in the living area and kitchen. In the summer there are a table and chairs outside in the garden where you can sit and enjoy the mountain views. Dominique has an extensive vegetable and herb garden which she will be only too happy to give you a tour around. I would highly recommend eating evening meals at least once during your stay to taste the produce of Dominique's garden which is always beautifully cuisined! La Combe Fleurie was the first bed and breakfast to open in the Champsaur Valley and is probably one of the most successful. You need to book at least a year in advance to secure a place for a full week as weekends are very popular with local tourists. It is it's owners, Donald (Scottish) and Agnes (a local Champsaurian) who really make La Combe Fleurie special. The property is their home and when you stay there, you stay with them. Of course you have your own ensuite bedroom as do they but everything else is shared. If you are offered a cup of tea, it won't appear on your bill at the end of the week - it is simply an invitation to share a drink! There are 5 ensuite bedrooms, including family and double rooms with modern shower rooms and separate toilets in each room. In the living room there is a cosy area around the wood burner, a games table and large sociable dining table. 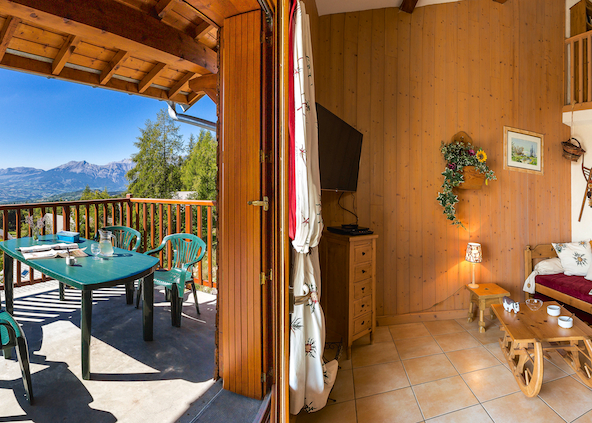 Outside you have some of the most beautiful mountain views of the area and the downstairs rooms each have their own terrace as well as a shared sun terrace to soak in those sun rays, the Southern Alps are famous for! There are large grounds with an orchard and impressive vegetable garden outside for children to run around in (not in the actual vegetables!!). It is possible to eat evening meals here and again I would highly recommend at least one night. The food is simple but good and ambiance is fun and sociable! 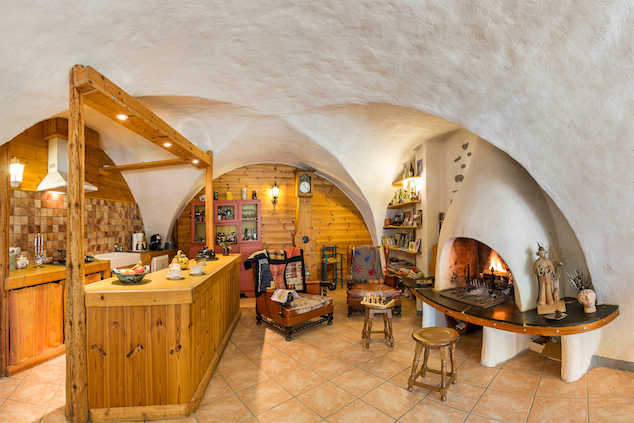 This is a traditional farmhouse of the region that has been beautifully renovated by Cecile and Eric. What makes this farmhouse special is the quality of the equipment and facilities available to guests - the kitchen is better equipped than my own! It is also one of the rare properties that can sleep two families comfortably in two double bedrooms and two bedrooms with three beds. Downstairs there is a beautiful open plan kitchen diner with an archway through to the cosy corner with sofas, a fabulous open fire and full TV DVD equipment. There are two bathrooms, one with a lovely large bath and a separate shower and one with just a shower and two toilets. The other great thing about Cecile's Farm is its location. It is in the middle of a large field next to the river Drac. You have the impression of being in the middle of nowhere but are actually only 3 mins drive from St Bonnet, a medieval village and the main centre of commerce of the valley. You have your own private garden but can also roam around the extensive grounds. There is a lake in the grounds, horses and children's swings! Another rare plus for this property is that Cecile includes sheets, towels and teatowels with the rental (most self catering properties in France do not include these) so there are no extras to pay and you can literally step off a plane and it's home from home - another attention to detail that reflects the quality of this property. Location Location Location is why these are in the top list! They are situated in a pretty ski village called Chaillol which is on the south facing side of the valley with views to die for of the Alps as they run out towards Provence. Each apartment has a south facing outside balcony or terrace with this view and sun right into the evening. There are beautiful walks right from the door and a great mountain biking descent and you are only 10 mins drive from St Bonnet, the main centre of commerce, the swimming lake and close to other mountain activities (for summer). For winter you have skiing right from your door and access to a whole host of other activities. There are a range of sizes and, like all French ski apartments, classified by capacity. Please note that an eight person apartment is great for a family of four or five but cramped if you actually had eight people in there! They are all nicely decorated in a chalet style with an open plan living area with dining tables and chairs, sofas with extra pull out beds and a functional but quite small kitchenette. It is worth mentioning that there are no traditional ovens in the kitchens, just hob and microwave. The bathrooms are clean and well maintained. Of all the accommodation we use for Undiscovered Alps activity holidays, these apartments represent the best value for money. 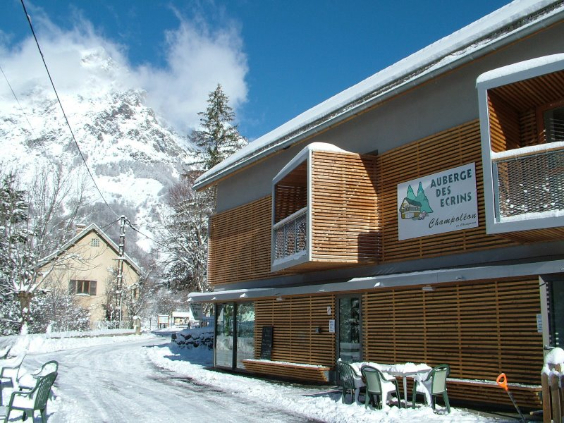 The Auberge is not quite a hotel but not a bed and breakfast either - more like a relaxed bistro with rooms! 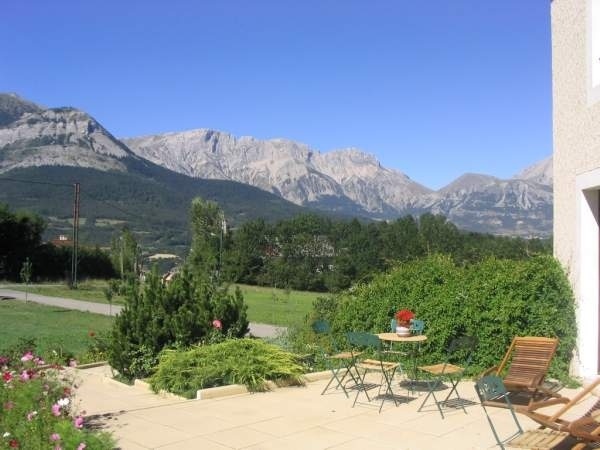 It is located in the wild Champoleon valley in a little hamlet and a perfect location for winter snowshoers, ski tourers or cross country skiers and in summer it's a great base for walking or mountain biking. It is run by a small team of local outdoories headed up by Stephanie and Laurent. Stephanie is a very good cook and the Auberge is one of the few places where you can actually get a good vegetarian dinner (that isn't an omelette!). Laurent is front of house and a great host. Nothing is too much trouble. They often host sporting events like moonlit cross country skiing evenings and musical events and have now got a very good reputation. If you happen to be staying when there is an event on - be prepared to get involved and have fun! Our client feedback for the last two New Year's Eve's has been that it's been 'the best New Year's Eve party' they have ever been to! It is a traditional farmhouse building that has been done out in a modern funky style. The actual accommodation is quite basic. There isn't a hotel cleaning service and your floor won't get swept half way through the week unless you ask for it. The entrance is sometimes piled up with deliveries, clients snowshoes and skis and it can seem quite chaotic. So why is it in my top list? Because it is fun and friendly, the team who run it are like minded outdoory and ecologically friendly people and the food is great! You stay here for the ambiance with an acceptable level of comfort and it's good value for money!